Imagine waking up in the morning to the site of nothing but turquoise water and blue skies with warm sunlight spilling through the window sheers. 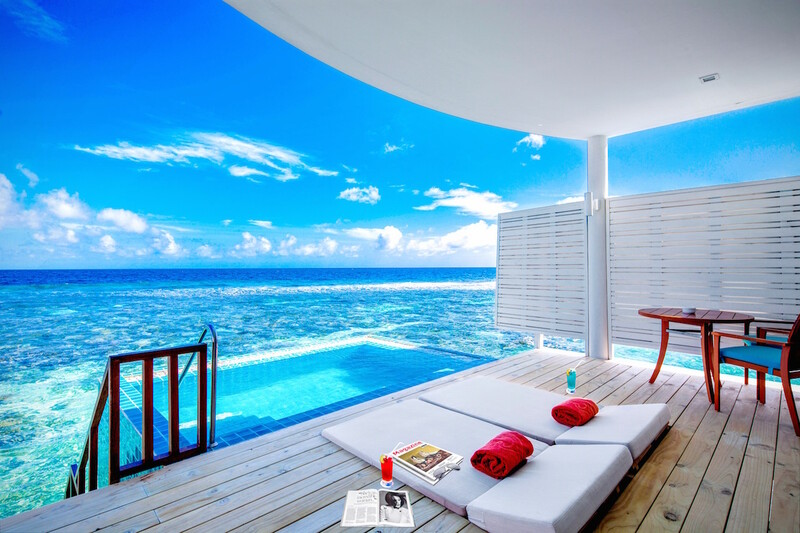 This can become a reality with the unveil of a new room category – Sunset Ocean Pool Villas – at Centara Grand Island Resort & Spa Maldives. Just steps down from the terrace of the newly renovated villas you can dive into the ocean or you can enjoy the 12 square-metre plunge pool with views across the ocean. The new villas are contemporary in style, luxurious in feel, and private in design. With 110 square-metres of living space, a true island hideaway, these new villas have all the right ingredients. The villas can accommodate 3 adults or 2 adults and 1 child. There is a seamless transition between indoor and outdoor living with large sliding glass doors that allows you to soak up all the beauty, from the comfort of your bed. 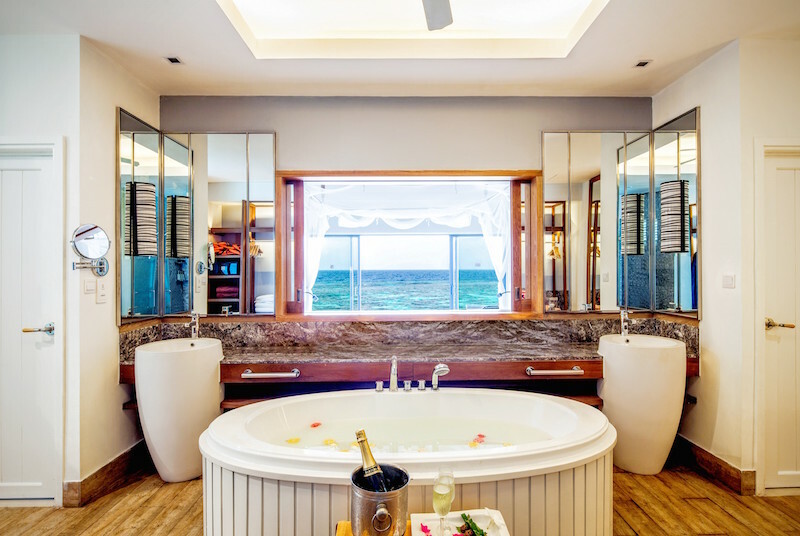 The spacious bathroom delivers on the ultimate luxury with a large bathtub, stand up shower, and plenty of counter space with his and her sinks. When booking this new room category, guests will have complete access to our premium Club facilities and experience the resorts renowned ‘Ultimate All-Inclusive’ plan that lives up to its name, delivering a cash free holiday. Some of the additional benefits include: exclusive access to The Club’s indoor and outdoor private lounges, private Club swimming pool, and a premium dining venue for breakfast, lunch and dinner, plus the Club Bar; Club lounge check in/out; WiFi and internet services in the Club Lounge; and upgraded in-room amenities. Additionally, the ‘Ultimate All-Inclusive’ plan provides guests with champagne breakfasts, a choice of three lunch and dinner options, free flow open bars, access to non-motorised water sports, off island excursions and daily access to a variety of spa treatments at the luxury, award winning SPA Cenvaree. 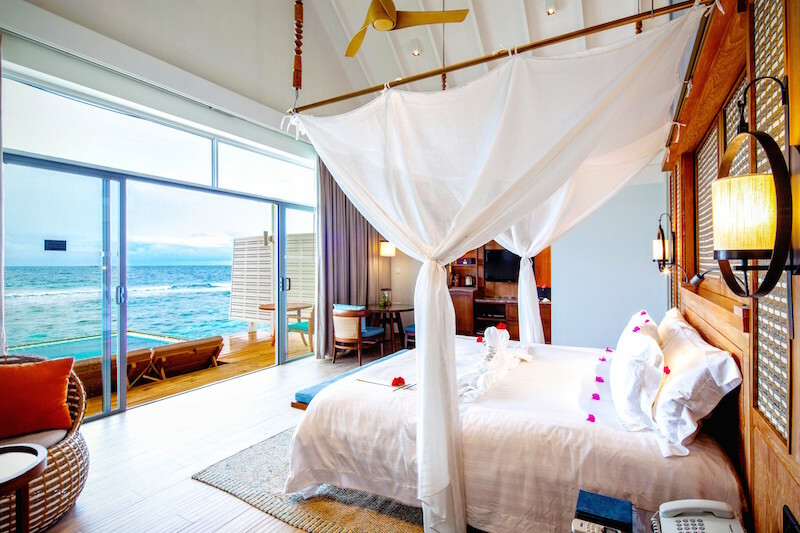 This new room category – Sunset Ocean Pool Villas– ties together all of the best elements of a Maldives escape with unobstructed views of the perfectly crystal clear blue waters, privacy, direct access to the ocean and the ultimate in luxury amenities.